Peonies are prized by gardeners everywhere. They seem to be especially trendy right now, but they never really do go out of style. Not only are their blooms so glamorous, but these plants literally last decades in the garden. For this assortment, we'll select 6 peonies proven to be favorites in the home garden. Because if you're expecting a display to last through the ages, you'll want nothing but the best in it. 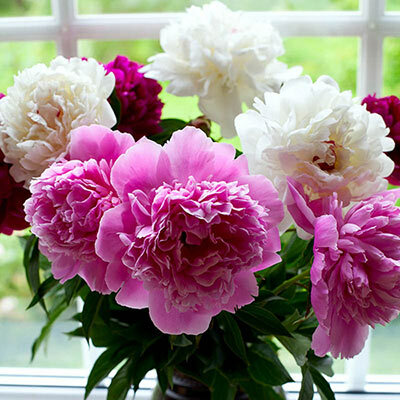 Take advantage of the peony's carefree, long-lasting nature by using it as a flowering foundation plant. Also, be sure to snip some blooms for the most elegant bouquets. Peonies have few requirements: give them a sunny well-drained location, plant 2-4' apart, with the eyes (new buds at the crown) no more than 2" below soil level and apply fertilizer or compost in spring. Healthy peonies take time to establish, often 3 years before they start blooming—but the wait is worth it. They are heirloom quality. Let them grow undisturbed and they will bring joy to you and your loved ones through the decades. Plus, even before they begin producing blooms, you can depend on a handsome foliage display from spring through fall.